Periodically we show films highlighting green issues, followed by discussion and drinks. These have proved a good way to get to know people who share common concerns and interests and also a great stimulus to thought and action. Watch our calendar and subscribe to our newsletter to ensure you hear about the next one! Below Joe Duggan looks back at some of our screenings and what they have provoked and highlighted. It may not have been the sexiest of titles: “I mean I live in Crystal Palace, what’s farming got to do with me?” Well, like the little children who don’t actually believe their Big Mac has got any connection with the cute black and white cow in their picture books, I, like a lot of people, have lost my awareness of where my food comes from and how it gets to my plate. Watching A Farm for our Future made me think again. The sandwich I pick up at a garage or a supermarket is oil dependent in ways I had never considered. Each ingredient is grown, processed, transported (by land, sea and air), cooked and greenhoused, using methods that are only possible with cheap fuels. The documentary looked at the alternative forms of food production, and the new considerations needed to make it work locally. The harsh realities of running low on cheap oil, focuses the mind to look at actions and makes me realise how having an active ‘food and growing group’ will be at the core of Crystal Palace Transition Town. An interesting discussion followed, including reflections on previous food initiatives in the area, and ways we could move forward, such as garden sharing, co-ops and community growing. Obviously a more attractive title, judging by our full house in the Gipsy Hill Tavern! This was an ambitious and sweeping indictment of the negative aspects of globalisation, moving across the globe to make its points. It highlighted how communities can be torn apart by competition and capitalism, and some of the ridiculously unsustainable models of trade it creates. 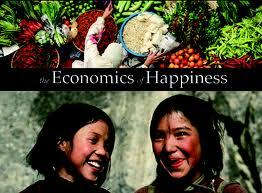 It also illustrated how cultural identity can be eroded by global marketing. The second half of the film dealt with positive local solutions, and it was inspiring to see Transition Town Totnes featured alongside urban gardening programmes in previously derelict parts of the U.S.. In the discussion afterwards, some people thought it simplified issues a little too much: over-romanticising subsistence farming; not acknowledging the positive aspects of globalisation. It was, however, very exciting to see 60 people coming out on a Sunday Night to discuss what they can do locally to be part of the solution! It also reminded us of one of the key aspects of Transition Town movement that can be overlooked: it’s about building and supporting communities and their cultures. Imagine an ocean without fish. Imagine the global consequences. Scientists predict that if we continue overfishing as we are now, we will see the end of most seafood by 2048. A wake-up call to the world, this film examines a potential environmental disaster and points to the solutions. This is the film that inspired Hugh Fearnley Whittingstall’s Fish Fight campaign for sustainable fishing. Let it inspire you to become part of the solution. We’re going to have to stop showing films beginning with “The end of …” ! 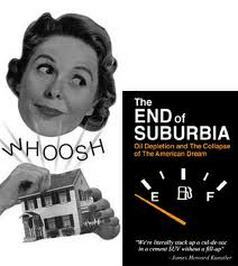 This however was an intelligent, witty and thought-provoking analysis of how the suburban model of living in the U.S. has been set up along unsustainable assumptions. Completely reliant on automobiles and often hundreds of miles from food production centres, the suburbs are in danger of becoming ghost towns and slums, unless a conscious effort is made towards to a transition beyond cheap oil. Although the film looked mainly at the U.S. there was much that could be related to the U.K. It also provided very strong and convincing arguments towards the reality of peak oil and its implications. Again, not necessarily a good first date movie. The highlight of the night though, was for me, the discussions that followed. For the first time we invited people to walk around and speak to representatives of the groups that we are setting up : Food, Skill Share, Energy, and Fairtrade (Local and Global). People were invited to contribute their ideas and, if they wished to, sign up to be part of the group. We gained some new members for many of the groups and also had some interesting ideas on our “Other Ideas” brainstorm. This is definitely a feature we would like to continue at our next Green Screenings. When the Soviet Union collapsed in 1990, Cuba's economy went into a tailspin. With imports of oil cut by more than half – and food by 80 percent – people were desperate. This film tells of the hardships and struggles as well as the community and creativity of the Cuban people during this difficult time. Cubans share how they transitioned from a highly mechanized, industrial agricultural system to one using organic methods of farming and local, urban gardens. It is an unusual look into the Cuban culture during this economic crisis, which they call "The Special Period." The film opens with a short history of Peak Oil, a term for the time in our history when world oil production will reach its all-time peak and begin to decline forever. Cuba, the only country that has faced such a crisis – the massive reduction of fossil fuels – is an example of options and hope. This film from Greenpeace addresses the crucial energy question: how can we combat climate change and ensure energy security without nuclear power? Part of the answer lies in the fact that large centralised electricity generating stations lose around 65% of their energy as waste heat. A number of countries are slashing their carbon emissions by locating energy production close to where it is used and utilising that waste heat to heat buildings and districts. Why aren’t we?